Day hike, with various route options, leading to an overlook for the Piedras Blancas Glacier, one of the lowest hanging glaciers in the zone of Mount Fitz Roy. Starting Point: 15 Km from El Chaltén along Provincial Route 23, at the bridge over the Blanco River. Alternate route leaves from north end of El Chaltén, Av. San Martin. Ending Point: Bridge over the Blanco River or north end of El Chaltén, Av. San Martin. Considerations: There are several routes possible for this hike. Read the descriptions below and obtain a map of the zone from the Park Visitor Information Center. Distance: 12 Km, out and back, to reach the overlook from the most direct route. 16 Km, out and back, if you continue to the Camping Area or access via the alternative route. Duration: 3 - 6 hours. From the bridge over the Blanco River along Provincial Route 23, take the trail that goes alongside the river. After approximately two hours, you will reach an overlook with a westerly view of the Piedras Blancas Glacier. You cannot cross the river here. 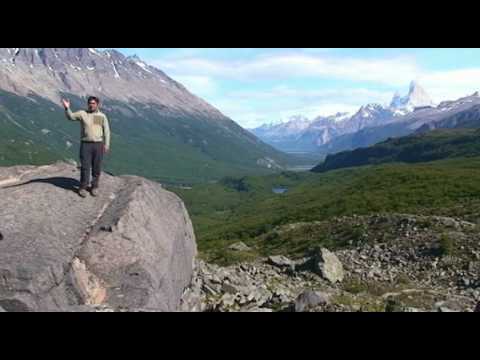 Continue to the Poincenot Camp and from there; head back to El Chaltén or camp overnight. Another alternative is to take the trail from El Chaltén to the De los Tres Lagoon and cross the footbridge over the Blanco River. After crossing the footbridge, at the mountaineering camp, detour right, heading down river. Continue on this path to the Piedras Blancas Stream, descending west, a little less than an hour's walk from Camp Poincenot. Turn 90° west, in front of the glacier, on the trail that traces the right bank of the stream. Cross, just before the river’s start. Once on the other side of the river, follow it down, almost to the lake, where you will have an excellent view of the northeast face of Fitz Roy and its glacier. There are still no roads through the last kilometers of the Aysén Region but that doesn't deter the true adventurers who hike across the border on foot from Candelario Mansilla to El Chaltén, (many with bikes in hand)! Accompanied by incredible views of majestic Mount Fitz Roy and the Desierto Lagoon, this 34 km hike is one of this part of Patagonia's greatest secrets.